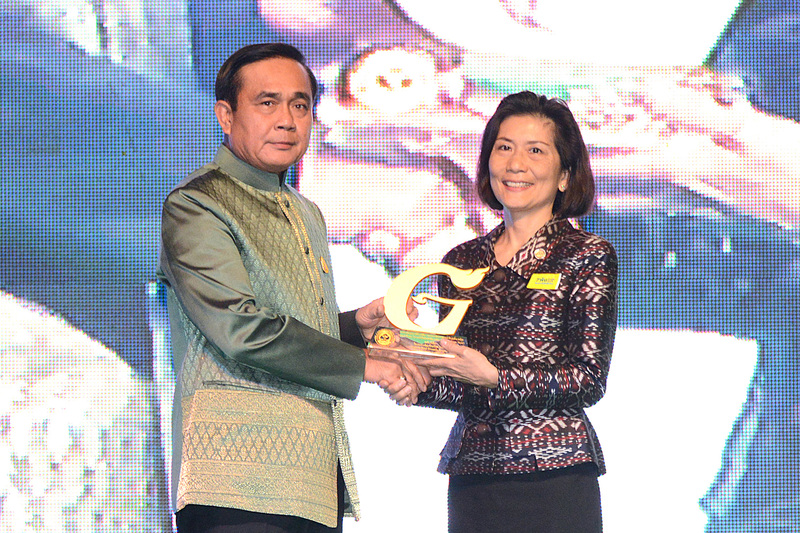 Bangkok, June 2015: Chatrium Hotel Riverside Bangkok and Chatrium Residence Sathon Bangkok claimed the Green Hotel (Gold) Award 2015. The award for being an eco-friendly hotel was presented by H.E. General Prayuth Chan-ocha, Prime Minister, on World Environment Day with the theme of “7 Billion Dreams, One Planet, Consume with Care” at Royal Paragon Hall, Siam Paragon. Chatrium Hotel Riverside Bangkok and Chatrium Residence Sathon Bangkok are strong advocates for environmentally friendly hotels and received the Green Hotel G Mark- Golden Level award 2015 for their eco-friendly Hotel measures; including the 100% tree free amenities’ packaging which were created to protect and preserve the environment. Chatrium Hotel Riverside Bangkok and Chatrium Residence Sathon Bangkok carefully crafted an environmental collection of guest room amenities for the properties in an effort toward preserving the resources of the planet, and to continue an eco-responsible approach. All items are “Tree Free” and made from stone p aper, an ultra-sustainable and eco-friendly paper-like material made from stone remains. In addition, all accessory items are packaged in biodegradable tubes and sachets that have been carefully selected and manufactured with d2w® controlled-life additives which are environmentally friendly and sustainable. Conditioning shampoo, shower gel and body lotion are paraben free, without animal testing, no SLS and approved by Thai FDA (Food and Drug Administration. It is through this effort that Chatrium Hotel Riverside Bangkok and Chatrium Residence Sathon Bangkok fulfills in part, its environmental responsibility according to the World Environment Day mission “7 Billion Dreams, One Planet, Consume with Care”. “We are greatly honored and pleased of receiving the G Mark-Golden Level award from the Ministry of Natural Resources and Environment. We continually strive to maintain and improve upon eco-friendly measures we have already put in place. We always consider our promise of “Think First Think Earth” when considering any action that might impact the environment. The Green Hotel (Gold) Award is outside recognition of the continual striving for sustainable actions by Chatrium and is most appreciated”, said Mrs. Savitri Ramyarupa, Managing Director of Chatrium Hotels & Residences.